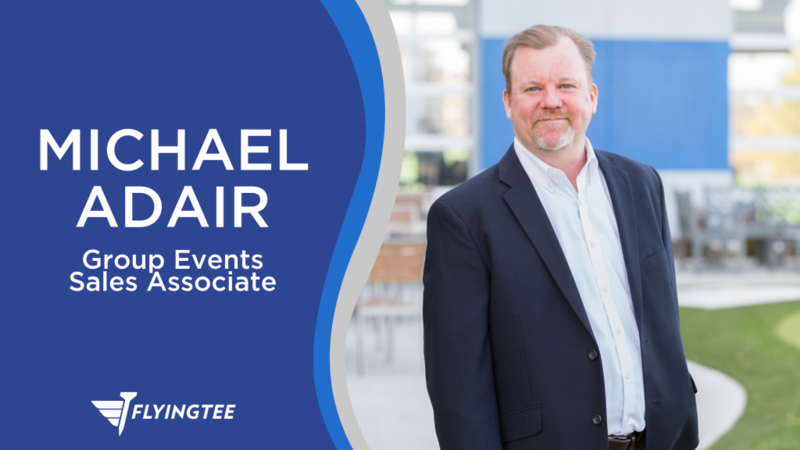 Michael Adair, Private Event and Group Sales Associate, has worked his way up through several roles within the FlyingTee family. Having begun at the very point where our visitors are first greeted, our Guest Services desk. Adair is no stranger to all it takes to create the ultimate guest experience from the warm welcome through to the fond farewell. “Work like you don’t need the money. Love like you’ve never been hurt. Dance like no one is watching,” by Satchel Paige is his favorite quote and truly embodies how Adair thinks outside of the box to create WOW experiences for each and every client or guests who visit FlyingTee. When asked what he does at FlyingTee words like illuminate, enthusiastic, entertaining, successful and experience were key components of how he described his role. “Delivery on promises drives me”, he shared. Whether working on your next event or drifting away to some great music while traveling, Adair is someone you can depend on to create and follow through on your next FlyingTee group experience. When he is not working: Following baseball, watching OU anything, traveling or listening to live music.